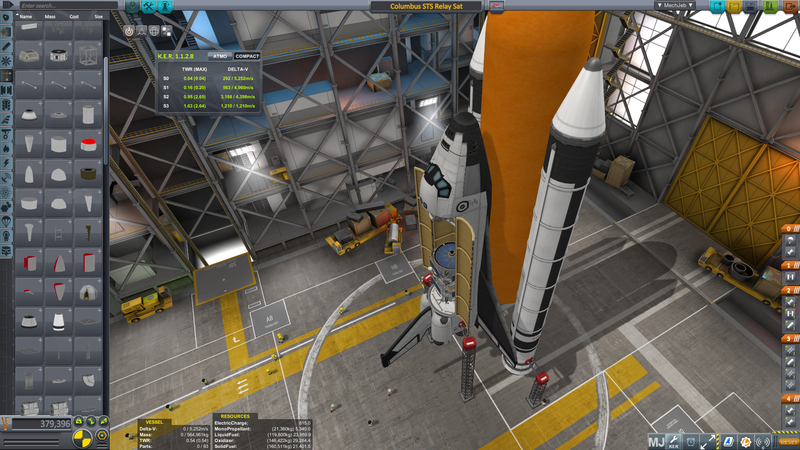 A mod shuttle called Columbus. It’s basically a close mock up of Columbia with extra monoprop and reaction wheels hidden in the main fuel tank. It can be a handful on the way into orbit. There’s a truss section with radiators in the cargo bay, this was hastefully uploaded for a friend. It can fly it into a 400 km orbit with little in the way of reserve delta v.
To launch, throttle up, engage RCS and SAS, pull back on the stick, and stage to light the SRB’s. You will slow down at SRB seperation, but you will begin accelerating within 15-20 seconds. She’ll get there, just give it a second. Once in orbit, limit throttle to 30% on the OMS or else it becomes the world’s best backflipper.